So there’s this book that you’ve probably read, or someone you know has certainly read. Pretty much everyone I know seems to have read it and touted its genius and capacity for transforming one’s existence. Which is nothing less than the premise and the promise of the book: The Life-Changing Magic of Tidying Up. This was a book that I vowed I would not read. Probably at least 85% of the fights I had with my mother when I was a teenager revolved around the state of my messy bedroom, and the stuff she wanted me to throw away to remedy it. Every time I moved to a different place at university, I would be up late in the night, battling with all my junk. During one of those moves I remember going out to the dumpster at midnight with my roommate to throw out six giant pickle jars (empty of pickles, but full of pickle juice, which I reused to pickle baby carrots, apparently in truly monumental quantities). When Tony and I were engaged and contemplating moving our combined belongings across the Sierra Nevada to Utah, he came over to my house to go through all my “special boxes” in my parents’ garage. Together, we decided which items I should keep, and which ones to throw away. At the end, I looked at the pile of things to throw away, and cried. I kept it all. Somewhere along the line, Tony bought me a set of clear plastic containers and gave up trying to get me to throw any of it out. Suffice it to say that I have always found it hard to let things go. When Marie Kondo’s book became popular, we were living in a four bedroom house in Florida. I had a big walk-in closet (which doubled as a tornado shelter), a giant garage, a pantry, and loads of other storage in various areas of the house. So I was in a prime position to take advantage of all the fabulous stuff people left out on the curb because they didn’t need it. I didn’t need it either, but I was not about to let that stop me. A set of huge aquariums? A hydroponic gardening system? A chest of drawers I couldn’t fit in my house, but left in the garage to fill up with all the other stuff I was collecting? Why not? I’ll admit, it was a bit out of control. We downsized spectacularly when we packed up to move to Amsterdam, because we knew we would be moving into a two bedroom flat. In a sort of rapid-fire reversal of the previous three years, we left pile after pile out on the curb. Most of it was gone within hours, if not minutes. Even so, once we unpacked at the diminutive flat with which you are by now intimately acquainted, we got rid of much, much more. In fact, just a few weeks ago we were going through the final few boxes of miscellaneous stuff. Thanks to the size of our house and the intentionality with which we’ve organised it, I’ve actually become quite good at deciding what I need and what I do not, as well as what I want to keep and what I do not. But I’m still not one to get rid of things that carry memories, especially when they record those memories via the written word. Not surprisingly, I work in an archive, where I am constantly and delightfully validated in my compulsion to treasure every scrap of paper with a word written on it. About a year into my employment there, just after we’d bought our house and had everything shipped across the Atlantic, I had the epiphany that I could donate my (considerable) collection of letters, diaries, and memorabilia documenting my years abroad, to the Expatriate Archive Centre, where it would be preserved, further the cause of research, and stop taking up space in my tiny house. I carried it to the archive on the back of my bicycle in several batches, one of which involved me having to choose between using my raincoat to keep myself or the prospective archival material dry. You can probably guess which one I picked. It’s all safely stored now in acid-free boxes, and gazes down on me benignly as I work, waiting patiently for some phantasmagorical future period in which I will have time to help the archivist start processing it. Having already accomplished this and other dramatic feats of decluttering and organising, I figured I was ready to take a stab at reading The Book. I reasoned that I had already mastered what I imagined must be the lion’s share of possible organising, and felt quite smug about my superior paucity of extraneous possessions. Still, maybe I could garner the odd tip. Plus, the very week I started reading the book, I saw this hilarious mockery by JP Sears, and that sealed the deal. I was several bike rides into the audiobook, and feeling sceptical. She kept talking about how much she’d loved organising ever since she was a child, and I tried to keep an open mind, but couldn’t help thinking she was a bit of a kook. But then, I spent my childhood up a tree with a book, so who am I to talk? Eventually she got into the nitty gritties about the clothes, and it kind of started getting good. And I thought I’d give it a bit of a whirl. Maybe I wouldn’t go through my whole closet; I’d hold just a few articles of clothing in my hands and see if they sparked joy. They didn’t. So I tried a few more. No dice. 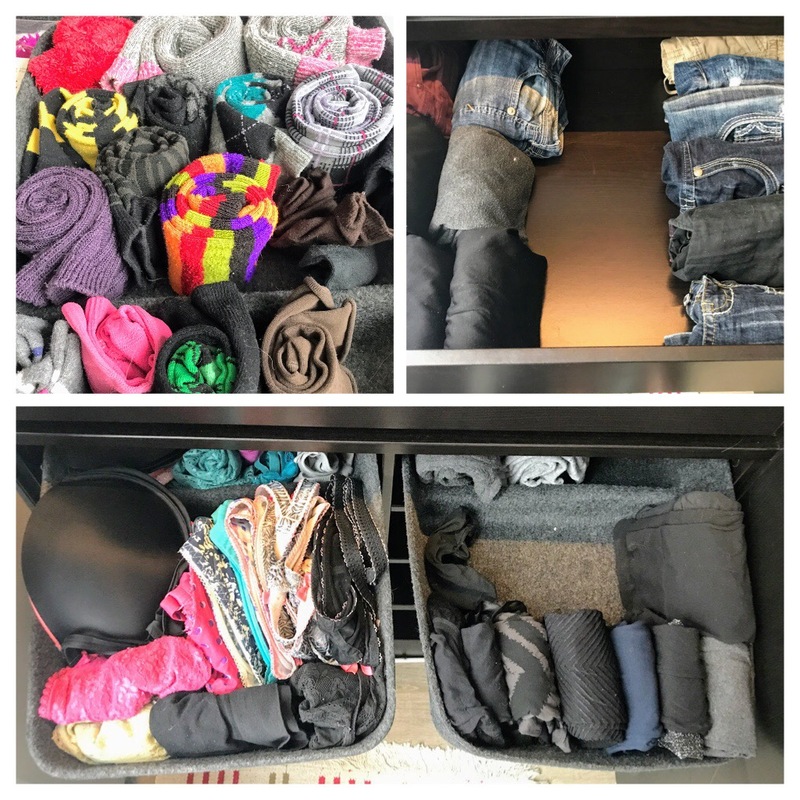 More clothes, and joy was seriously not sparking, and the pile of throwaways was getting bigger, and I was about to end up like JP Sears, standing there in my underwear, except I’m not sure even my underwear sparks joy. There was my red dress that I’m wearing for our vow renewal in Iceland in August, and that totally gave me the thrill she described. But it’s not very practical for everyday wear. In the end, I dialed down the throwing away. Because I unfortunately don’t live in a nudist colony. But I did get rid of quite a pile, and the rest I folded according to her instructions, finding the resulting extra space actually quite magical indeed. And I did notice a few things. For one, I realised that a big reason I don’t throw out clothing is because I don’t tend to keep a lot of it around in the first place (you saw the size of my wardrobe). I have this familiar sinking feeling where I know that if I get rid of clothes then I will have to go shopping for clothes, and above all things I hate shopping for clothes. When we lived in Italy I did grasp the concept of buying everything in black, because then it all matches and you don’t need much of it, and you can achieve some semblance of presentability without much effort. But I’ve gotten sloppy here in the Netherlands, where fashion is an outrageous game of crazy colours, cuts, and patterns. Someone should really do Dutch fashion paper dolls. Red pants, brown shoes, and polka dotted socks are the order of the day around here. 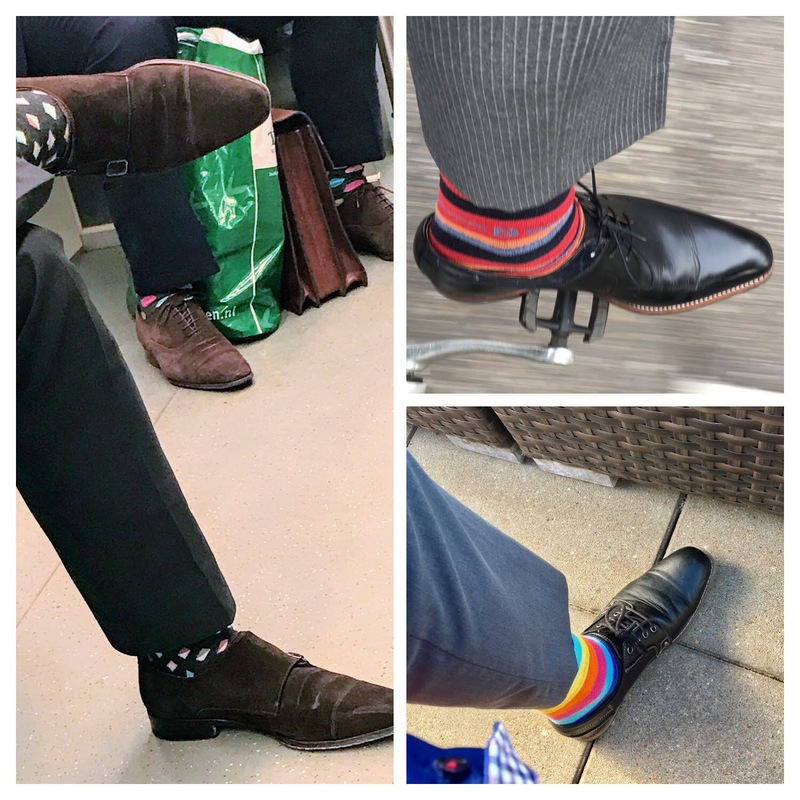 I confess to a collection of creeper photos of men’s ankles, although in my defence most of them are my husband’s. This is obviously one of those bare all sorts of posts, so I’ll go ahead here and confess that lately I’ve gotten in the terrible habit of buying clothes out of the random overstock bin at the grocery store, of all places. So I have stuff like a baby pink fleece jumpsuit that I can’t wear outside the house because it makes me look like a skinny teletubby, or a blue, vaguely cardigan-like thing made out of a fabric that most closely resembles plastic. And then there was the time when I bought like a dozen deeply discounted shirts and dresses online from Bravissimo in weird colours like mustard yellow stripes and navy blue with orange polka dots. I am not joking. They’re mostly summer dresses, and I’ve enjoyed wearing them so far, but even I can admit they are not long-term wardrobe staples. So it’s back to a minimalist wardrobe for me. I kept an assortment of black skirts and tights and pants, and I just ordered several tanks and shirts and blouses, all in black or white, even when I saw other pretty colours on sale. I’m seriously looking forward to everything matching again, and maybe even wearing some of my fun, colourful scarves that I realise I’ve stopped wearing with my non-black wardrobe to avoid looking like a patchwork quilt. So from a clothes perspective Marie Kondo’s “method”, if not life changing, at least jolted me back to my former sanity of wardrobe. I had to take a few hundred of my books down off the shelf a couple of weeks ago so that we could move the bookshelf several centimetres to the right. So I have recently held them individually in my hands, and I can confirm that each and every one of them did indeed spark joy, whether I had read it, intended to read it, or had collected it for some other reason. I could take that as a representative sample, but I also went the extra mile and ran my fingers lightly over the spines of the books in all my other bookshelves. And the joy was just sparking off like crazy, like static electricity. So I’m keeping all of those, although I have a loose moratorium on getting any more books. Unless I really need them. Or I get them for free. Or somebody I trust recommends them. But I’m not, like, purposely going to library book sales with several empty bags, intending to come home with dozens of books anymore. (Those were the days!) Marie Kondo would be proud. I’m with you on the books. I did the kitchenware and the clothes with great success and even attempted the file cabinets. But when it came to the books, well they all spark joy. Could be a hereditary thing. I was listening to the section on file cabinets, and it cracked me up how many times she just said to throw everything away. Tony and I just re-labelled our important files. 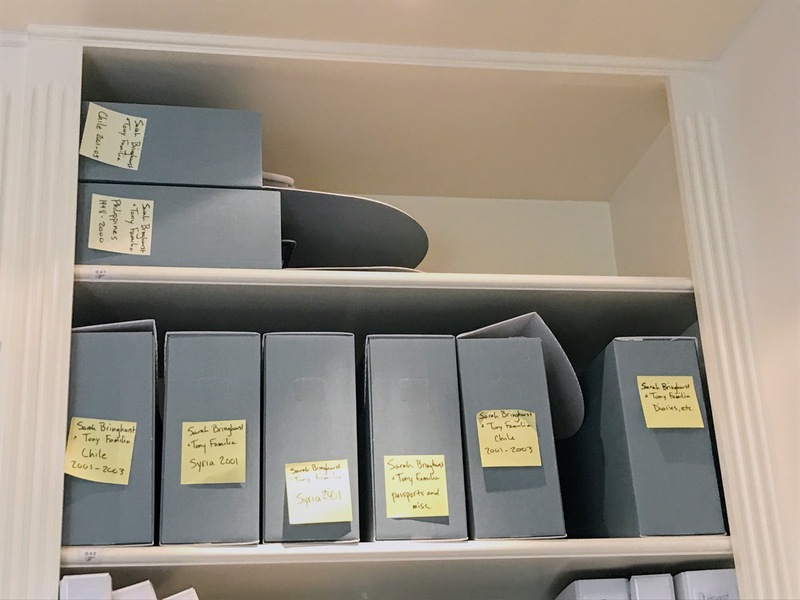 We literally now have three folders for each person, as well as three for our family at large; one each for US documents, Italian documents, and documents from other countries. Ridiculous, but necessary.